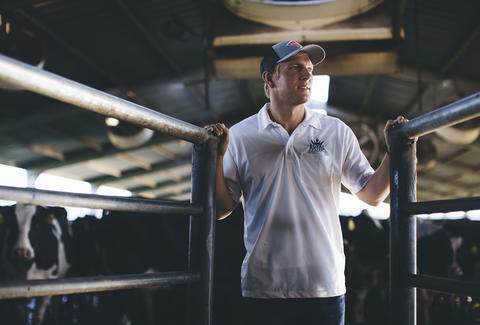 Austin Allred is so devoted to dairy farming that he switched over to it after growing up as a crop farmer. 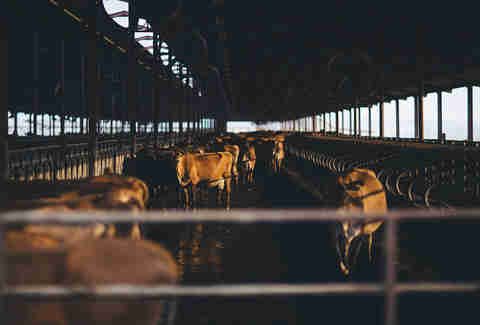 He now runs Royal Dairy, located in central Washington, where cows are a powerful tool in an astonishing process that creates bio-rich soil and clean irrigation water while cutting down greenhouse gases. That’s because as much as Royal Dairy cares about what goes into the cows, visitors will quickly realize that their operation is equally concerned with what comes out of them. And if you think the only answer to that is “milk," then Allred and his team are ready to open your eyes even as you pinch your nostrils. Turns out there’s gold in them thar cow pies. Allred feels that cows are underappreciated for “the incredible miracle of their digestive system.” Before dairy farming, he used to grow potatoes, apples, and cherries -- now, he uses that knowledge and those connections to other crop farmers to ensure his herd gets an optimized diet. Their feed comes from a variety of sources: everything from corn and alfalfa to grape pomace leftover from winemaking are good for bovine stomachs, which are a better destination for it than landfills. Sometimes those lucky cows even get french fries as a treat. 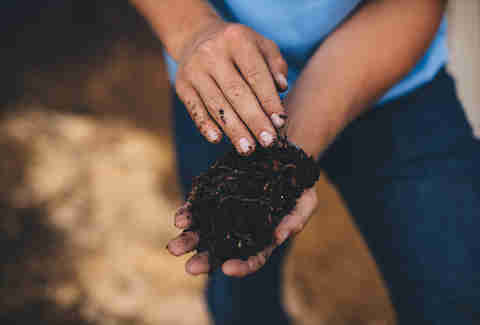 A cow’s digestive system is able to equalize those ingredients into nutrients that enrich soil in a way the uneaten product, if composted, would not. Not that Allred doesn’t do hard work, too. His job -- or as he puts it, his responsibility -- is to extract that chemical goodness in an energy-efficient manner, with as little waste as possible, to give plants a powerhouse meal that charges up their growth. So how does the farm turn stinky cow manure into clean irrigation water? It’s not by using more water, though you’d be forgiven for assuming so. To most people, cow manure equals fertilizer. Take it, put it back into the fields, and you’ve got the circle of life, right? What we non-farmers don't realize is that manure and manure water are actually so nutritious for plants as to be damaging. Plants can experience something called “nutrient burn” -- the plant equivalent of devouring a feast without a single glass of water to wash it down. If plants get too many nutrients, the excess that they don’t use can affect pH levels in the soil, cause irregular growing, and many other problematic behaviors depending on the particular plants and nutrients. 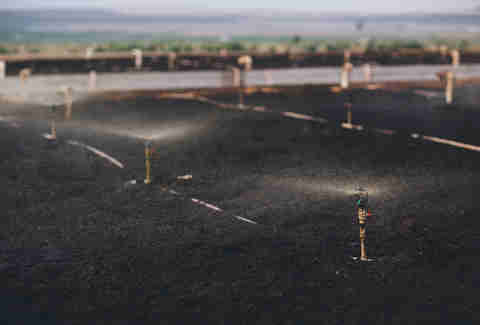 That processing strips the manure of its 90% water content, separates the nutrients for later use, and also traps gases like ammonia for a three-way win. That manure water is then clean enough for use around the farm, no longer a byproduct but essential contribution to the farm. Pretty neat trick, harvesting the best parts of manure while actually generating millions of gallons of water instead of using it for dilution. While too many nutrients sounds like a good problem to have, it is still a problem. And the best way to fix a good problem? Make it the solution for some other need. In fact, it’s literally a solution, because Royal Dairy balances out the pH of the irrigation water using techniques cribbed from Mother Nature herself. Allred and company have put the essential materials for that circle of life in a tight circuit to purify their product in very little time or energy. At this point wood chips absorb the liquid, and the many worms and microbes living in them feast on the nutrient-rich soup. After that feeding frenzy, the water that comes out is clean enough to put back on the fields for successful irrigation -- all without any chemical additives or unused byproducts. Even the worm casings (the professional term for worm poop) is usable as a fertilizer product that might get sold right back to an apple orchard. The economical and ecological benefits are obvious, but there's another you can't see so much as smell. You might think this poop-to-poop conversion makes for some stinky times, but Royal’s process means it actually keeps a lower profile on the olfactory landscape than the average dairy farm. That’s nice news for Allred’s neighbors’ noses. And since it’s all fairly passive, he ends up with more time on his hands than if he were managing waste the old way. That’s nice news for him. Right now, Allred is the only dairy farmer in Washington State using these practices -- and one of just a handful in the country. But far from keeping this more efficient system of production to themselves, Allred and his team are excited to spread the word about the biofilter and what it can offer to other farmers. Their enthusiasm for sustainability comes from both economical and ecological reasons -- something he stresses during the hundreds of tours he’s given on his farm. And since he just won the Outstanding Dairy Farm Sustainability award at the 2018 U.S. Dairy Sustainability Awards, people are listening. It seems paradoxical. Royal Dairy can only draw these environmental benefits by disseminating their business advantage to others. But some things are more valuable than next quarter’s earnings. Thankfully, in Allred the far-reaching profit has found its far-reaching prophet. To see more stories of people devoted to dairy, including those devoted to responsible production, visit UndeniablyDairy.org/devoted.